With thy Needle & Thread: Pattern Preview! Welcome to day 1 of the count down to the Nashville Needlework Market. 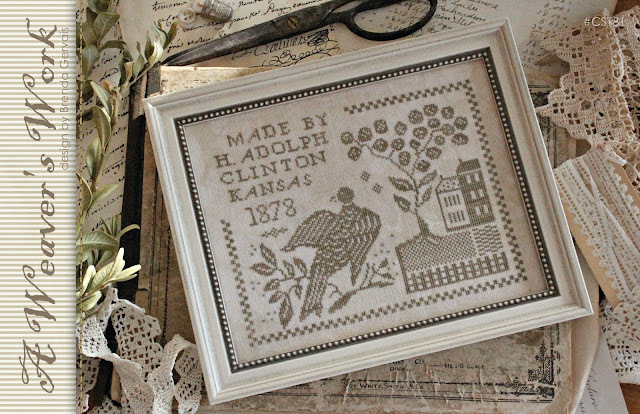 An 18th century wool coverlet was the inspiration for this piece. The simple farmhouse was the signature motif of the Gilmour brothers. I chose to work the piece in ivory tones for a fresh, white farmhouse feel. The piece would look great worked on an dirty ecru linen with rusty red or navy flosses as well. The unfinished wooden tray allows you to choose your color palette and paint it accordingly. Trays will be available for purchase. 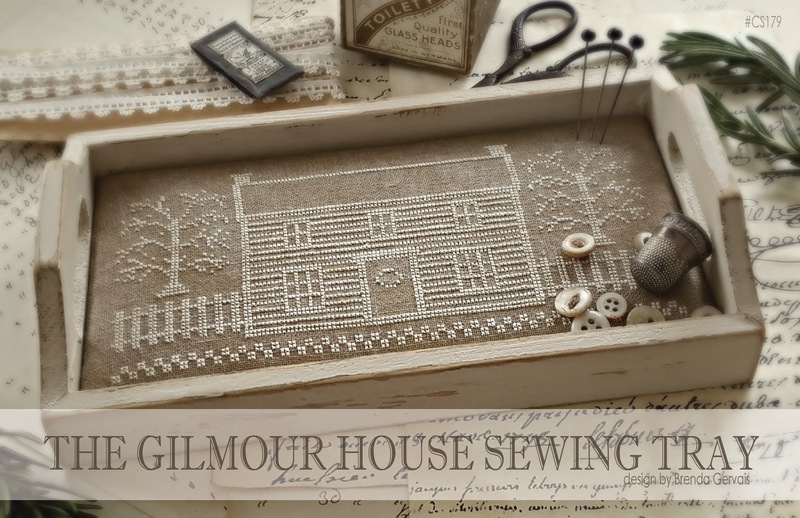 Another adaptation from an antique wool coverlet and a great companion piece to the Gilmour House sewing tray. After some research on this weaver, I was excited to learn that he spent some time in my home state of Iowa. I chose to work this in neutral tones and was excited to find what I felt was the perfect Larson-Juhl frame for this piece. This piece too could certainly be worked in other colors of flosses. "Spring Frolic at Bunny Hill"
Two frolicking rabbits adorn the lid of a Lone Elm shaker box. I chose to fill the box with paper grass and tucked some eggs into the "nest". The lid is then standing in the box and makes for a fun spring-time vignette! 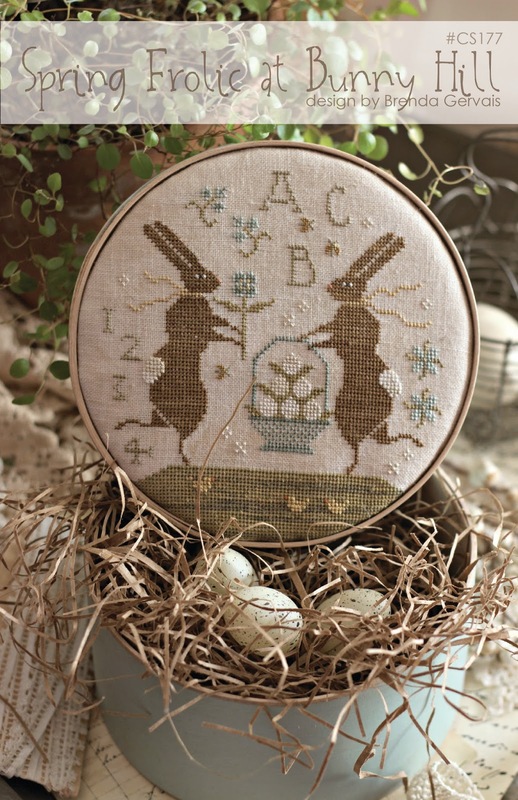 Leaping rabbit, tulips and a basket filled with springtime flowers creates a fun spring-time mini sampler. Perfect for Easter, yet could be kept out year round. A big "Thank You" to April Taylor for stitching this model. See you tomorrow for Day 2 of pattern previews! Wow love these. You are so talented. I love your designs so much and always have!! Now I have some more stash to buy!!! Wonderful! Each and every one!! Oh wow! More to add to my shopping list. Love them all! I really like those patterns grounded in history though! More stitching ahead for me! Yippee!!! Thank you for the gorgeous designs!! Can hardly wait to stitch them and see tomorrows goodies!! They all are lovely, but the first and the way it is set is really amazing! When can we see the others? 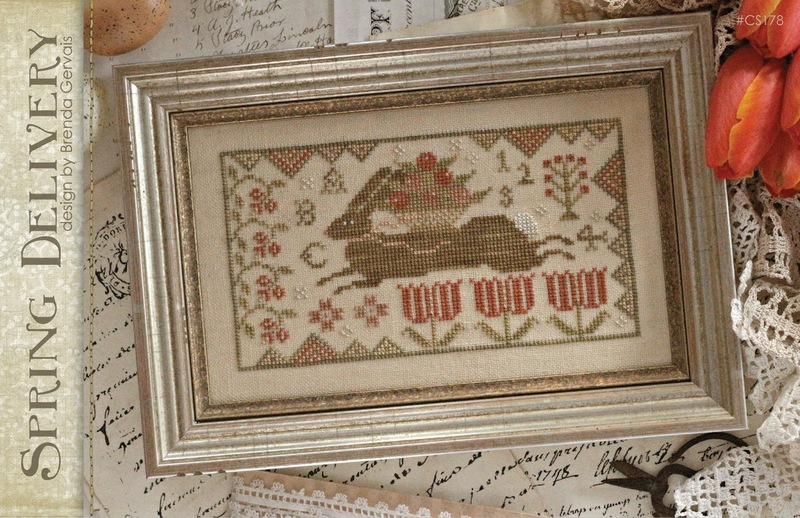 Brenda: I have to add these to my stash I will have to visit my favorite needlework shop. Thank-you for such lovely designs. Hi, Brenda--Glenna from Eye of the Needle here. I don't think I am a member of SW, although I can see friends' posts because they're friends. No, I didn't know that someone used my photo in conjunction with posting the chart. That is very upsetting. Not being a member and not being able to see it, I don't know if there's anything I can do about it. Love your Nashville stuff--I am the proud owner of four of your new charts, and will go back to In Stitches on Wednesday and will buy a couple more. Hi, I just finished "Three Tulips". What a beautiful pattern to stitch. I did really enjoy it. I wrote about your pattern on my blog and Instagram! Will stitch more of your patterns. No updates from Brenda since February. Hope she's OK. This house agree to me, and the format width, I really like it. Thanks a lot for sharing all useful information with everyone honestly.Well awesome work. Thanks for your list.